The BadFaithed #HomeTruths forum is designed to welcome a growing evidence trail of singular challenges arising for individuals, households and communities in the event of Domestic abuse, marital breakdown, relational mismanagement in faith communities. The IICSA process has been developing a national body of witness for those who have experienced abuse as children at the hands of those who are part of organisations such as Public Authorities, Policing, Education providers, Social Services, Health providers and Local Authorities to detail anonymously their experiences. 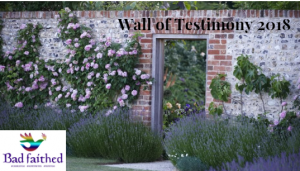 Here at Badfaithed we are building a wall of testimony for those who within the household of faith have experienced abuse whilst in the households of those who carry a professional role and authority within their faith communities. Owing to the similarity of faith communities to those of the military with tied housing frequently being an overlap we also welcome contributions from those who have experienced trauma, abuse and a lack of duty of care from their organisations who have reneged on the trust which was understood to be in place between them. If you have a contribution to make to this wall of testimony please fill in the form below. All contributions will be anonymised and separated from the email supplied in the following form.